If you’ve been on the internet at any point since 2006 you’re probably familiar with the video giant YouTube. With over 400 hours of video being upload to the site every single minute, it’s hard to do almost anything online without coming across a YouTube video. Although YouTube has been the go-to option for videos for years, only recently has it stepped into the live TV arena. YouTube TV is less than a year old and is quickly becoming one of the best streaming services for cord cutters. Is YouTube TV free like YouTube? How reliable is YouTube TV? What devices can I watch YouTube TV on? 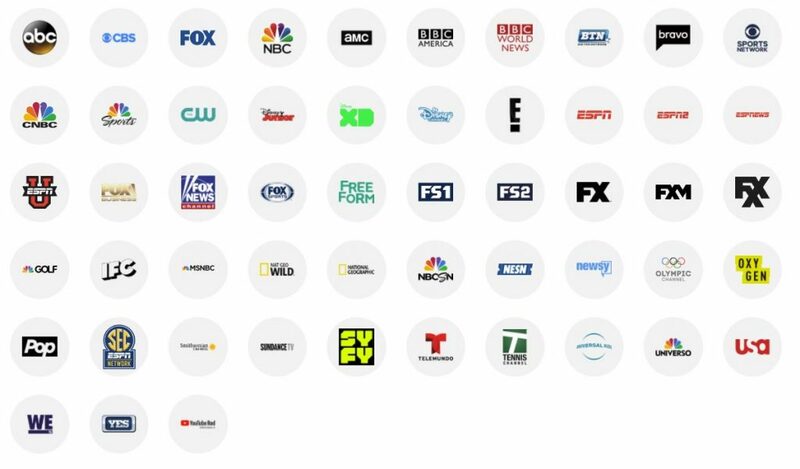 YouTube TV offers a variety of carefully selected channels to make the ultimate cord cutting service. A notable exception to the premium add-on listings for YouTube TV is HBO. Unless they roll it out in the next year, don’t count on watching Game of Thrones with your YouTube Now subscription! The closest comparison for streaming services would be to look at YouTube TV vs DirecTV Now’s “Live a Little” package. For $35 a month, you get 60 channels with DirecTV Now compared to YouTube TV’s 50. However, the channels are completely different and it would be like comparing potatoes to tomatoes; you just don’t do it. To show the difference, the image below shows the channels in the “Live a Little” package (only the channels in white). YouTube TV offers some of the most popular channels that cord cutters look for and cuts out the rest. By reducing the total amount of “fluff” channels, YouTube TV is able to pass on the savings to its customers. If you want to find out exactly what channels you’ll get at your location, enter your address into YouTube TV’s help site. YouTube TV is particularly cheap if you’re a sports fan, and is actually one of the cheapest ways to watch the 2018 Olympics if you don’t have cable! Stemming from the largest video hosting site on the planet gives YouTube TV a huge leg up in the DVR battle of subscription services. Actually, when we compare DVRs we’ve recently started to not even count YouTube TV. It’s so grossly ahead of the competition that it would hardly even be a comparison. If you’re someone who likes to record shows and watch them at your leisure, you’ll be happy to know YouTube TV includes a cloud DVR with unlimited storage. Let’s compare that to some of the other top streaming services really quick. Sony’s PlayStation Vue service offers unlimited storage, but will only store a recording for 28 days. 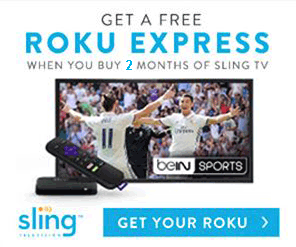 Sling TV charges $5 per month extra for 50 total hours of cloud DVR storage. Both DirecTV Now and Hulu don’t even have DVR for their services, but are expected to roll them out sometime this year. The closest DVR to YouTube’s would be PlayStation Vue, but YouTube will hold your recordings for an extra 8 months than Sony. Even if you don’t think you record much, when you know there’s no limit you might find yourself recording a lot more than usual. When we set up our YouTube account we quickly found that we were adding a lot of shows to our “Favorites” list and having them auto recorded “just in case”. When the sky’s the limit, why not? Although probably the best DVR in its class, it’s not perfect. Due to licensing deals (that are mostly secret), many of the shows you record will still have ads. You’d think that like a cable subscription’s DVR, if you record it, you should be able to fast forward through the commercials. With YouTube’s DVR, that’s not the case. Anything that you record that is also available on-demand will not have skippable ads. For example, if we record the latest episode of Big Bang Theory and then 24 hours later it becomes available on demand, we’d be forced to watch the on-demand version commercials and all. Skipping commercials is a large reason a lot of people DVR shows in the first place. This “feature” is unique to YouTube and many people believe it’s due to strained relationships with TV networks due to copyright issues on their flagship platform. You can pause live TV channels and rewind it though if you’re really upset you missed a certain commercial you liked! YouTube has had a decade to improve its video platform’s interface and you can see the fruits of that labor in YouTube TV. Unsurprisingly, YouTube TV is laid out remarkably similar to YouTube.com. There are horizontal rows of channels organized by viewing habits, currently started content, future content on live channels, and your recordings. Although it does a fantastic job at recommending content, at some point the show you’re looking for isn’t going to be on the home page. You’ll have to navigate to the top-right corner of the app and click on the search button. This is when you really understand that YouTube is owned by Google. 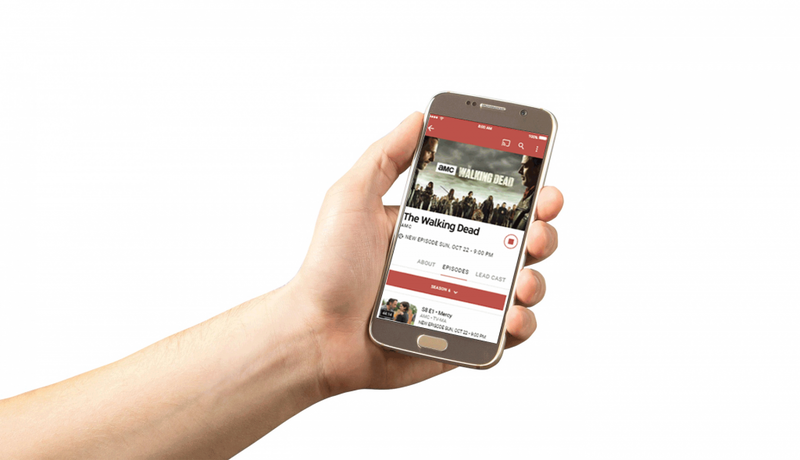 The search functions like a typical search engine allowing you to type in show titles, directors, actors, or even specific episodes of a show and get results for that search. Underneath all of that is the real power of YouTube TV. 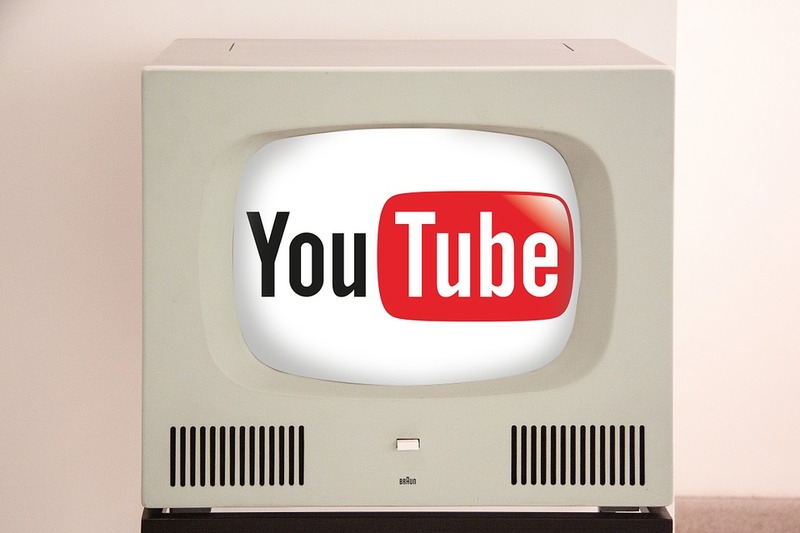 You can browse through YouTube’s content by channel and view each’s channels featured programming. You can select a genre and see recommended shows or movies that YouTube’s algorithm chooses for you based on your previous viewing habits. Or if you’re a sports fan, you can even browse through a list of every single sports league that is covered by any of YouTube TV’s channels. The “secondary search” is a really clever way for YouTube to save valuable screen space while still providing an excellent navigational tool for its platform. 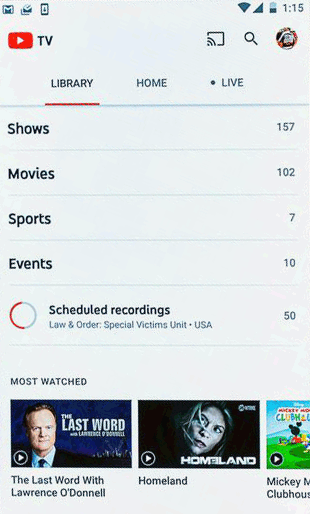 One other thing we really like about YouTube TV’s interface is the power of organization it gives the user; particularly for sports. You can select your favorite team or leagues and YouTube TV will bundle them into folders that let you browse recent matches. It also automatically saves your favorite team’s games regardless of what channel they appear on. While we realize most people don’t like to watch sports that aren’t live, it’s a huge benefit if your team is away and in a different time zone. We’re really excited to see how well YouTube can transition its interface to non-touch screen platforms. Although it’s not currently supported by Roku or Apple TVs yet, when it is (rumored early this year) there will have to be some modifications to it’s design. Reliability is a huge factor in streaming services. Nothing is worse than expecting to watch the Super Bowl for the first time ever without cable and getting a laggy/choppy stream. YouTube TV has this covered. The power of billions of Google dollars helps to keep YouTube running through everything short of a catastrophic world event. In our experience with the service, we didn’t encounter any streaming issues. Everything loaded quickly and even fast forwarding didn’t result in any notable buffering time or drops in quality. Still, the service isn’t perfect. If you’re a stickler for frames per second you might want to stay away from YouTube TV. Even though YouTube.com has supported 60 frames per second video for the last three years, Google has no plans to bring that to the YouTube TV service. For a lot of people, the extra 30 frames a second won’t matter. But if you’re one of the ones that’s bothered by it, we recommend sticking to DirecTV Now or PlayStation Vue. It makes a lot of sense to run Google’s YouTube TV service on a Google device. 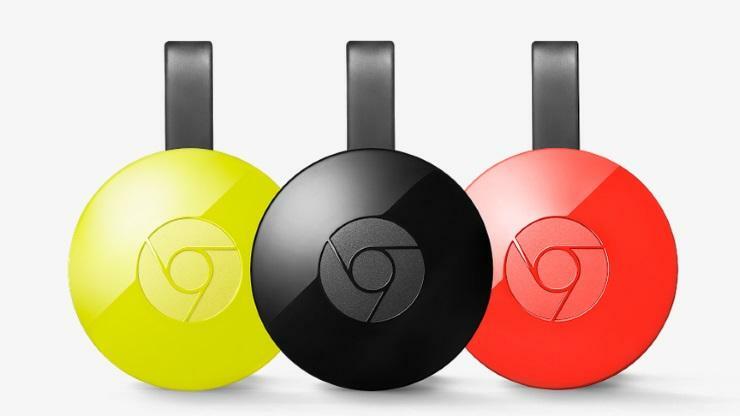 Google notes that you may experience errors if you use a first generation Chromecast rather than one of the new ones, but we tested the service over a week on ours without any issue.